[Instead, in a world where there is adequate leisure,] above all, there will be happiness and joy of life, instead of frayed nerves, weariness, and dyspepsia. The work exacted will be enough to make leisure delightful, but not enough to produce exhaustion. Since men will not be tired in their spare time, they will not demand only such amusements as are passive and vapid. At least one per cent will probably devote the time not spent in professional work to pursuits of some public importance, and, since they will not depend upon these pursuits for their livelihood, their originality will be unhampered, and there will be no need to conform to the standards set by elderly pundits. But it is not only in these exceptional cases that the advantages of leisure will appear. Ordinary men and women, having the opportunity of a happy life, will become more kindly and less persecuting and less inclined to view others with suspicion. The taste for war will die out, partly for this reason, and partly because it will involve long and severe work for all. Good nature is, of all moral qualities, the one that the world needs most, and good nature is the result of ease and security, not of a life of arduous struggle. Bertrand Russell (1872-1970) was a British philosopher, logician, mathematician, historian, social critic and political activist. At various points in his life he considered himself a liberal, a socialist, and a pacifist, but he also admitted that he had never been any of these in any profound sense. This passage was excerpted from his essay, "In Praise of Idleness". Seed questions for reflection: How do you relate to the author's thesis that originality springs forth when people do things that they are not required to do, but enjoy doing? Can you share a personal experience of a time that the harmfulness of hard work without any leisure became clear to you? How do you create a space for adequate leisure in your life? is an illusory vicious cycle that robs us of real joy and satisfaction and connecting to the land that sustains us. I don't know, maybe somewhere between Mary and Martha. A little of this and a little of that. I have been a "do-er" and in constant "active, productive mode" since I was a kid. But, the last 30 years, I have taken these qualities and been like a work-horse in the work world. I am exhausted. Luckily my husband got a 6 month contract that supports our family financially, so I am finally giving myself permission to rest. I have even noticed myself being "lazy" which has such negative connotations. Being Idle brings up "wasting time", and "not being productive' is something of which to be ashamed. It is a chronic habit that I am trying to change. IT IS TORTURE walking by the load of laundry that needs to be folded and saying, "I'm really not up for doing that right now." Our society doesn't know HOW to "do nothing" never mind "relish" in it. Let's start breaking that habit! Thanks this was so refreshing and loving that it was right in time with the neutral bias mentality I am fostering. 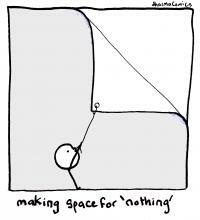 Here's to our joyful exertion and mindful space holding for what comes next. I work as a consultant to many large corporations and in the past year or so i have been sharing a quote from a dear friend and colleague, Patrick O'Neil: "What if we are moving too slowly to solve the challenges we face, because we are all moving too fast?!" Time for reflection and thinking is being squeezed in favor of unceasing action. My name is Dave, and I'm a workaholic -- whether I'm doing something that I think should be done or something I enjoy. I think workaholism is in one's attitude toward an activity as much as whether the activity is imposed or chosen. At least many activities can be approached with an attitude of enjoyment that is genuine, not made up, and it makes a big difference. Learning to do what I want more often, learning to relax, learning to smell the roses has been a long uneven process for me. A favorite saying of mine is "If you can spend a perfectly useless afternoon in a perfectly useless manner, you have learned how to live, said Lin Yu-t'ang -- I'm still learning to spend more time living uselessly. I definitely believe that originality and creativity spring forth when people hang loose, relax, enjoy what they are doing. There is a story that happiness (and peace, and wisdom, and an answer) is like a butterfly,and the more we chase it the more it eludes us, and when we quit trying and relax, the butterfly comes and gently sits on our shoulder. Most of us work too much, maybe because we are afraid to let go and be. Doing can definitely be a way to avoid being (and happiness, originality, peace), and being is becoming. I completely agree with the idea of idleness. I also agree that in earlier generations there was a sense of lightheartedness and play. So life was worth enjoying rather than worth working. As he number of hours of work per day has increased, all the lightheartedness and play has weathered. Life has become more of a race rather than a stopover to enjoy. I remember very vividly how my grandfather in a salary of â¹ 5000/- could enjoy relatives coming to our house. He did not feel that relatives are "overhead expenses". I worked for a corporate for 13 years and have experienced this. It was repeated that long hours of work means "success". From last 03 years I have left job and am working on my own. I want to say that I am earning at par with what I would have earned but 50% less efforts. And with personal ease end enjoyment. I am NOT saying that quality of my work has decreased but on the contrary it has increased. I enjoy the idelness which this work has given me. Thanks for sparking a revelation in me. This is a fantastic passage and one that very accurately captures that malaise of our civilization at this current time. Idleness is frowned upon as if its a crime while being busy is put on a pedestal. If one were to pause and observe our daily lives, the benefits of leisure will be very apparent. In the presence of leisure, daily life develops a beautiful wholesome flavor. This is totally missing if one is leading a harried, busy life. Bertrand Russell is one one of my favorite authors, thinkers and activists for social justice and fairness. I read what he writes with respectful attention. Work hard, don't be lazy, don't be a bum, has been a modern person's mantra. To write about " In Praise of Idleness" is by itself a bold and out-of-the box kind of thinking. The title of the article was good enough for me to read, reflect and respond. The Bhagvad Gita-The Divine Song- is one of the few books that have made me think about balance, equanimity, excellence in action, and fulfillment. The book for me is about asking deep questions about living a happy and fulfilling life. It is about discovering and practicing the Yogic way of living. A mindful and balanced way of living has been very helpful to me. i have learned that there is a time for work and time for leisure; a time to be alone and a time to be with others; a time to be serious and time to be silly; a time to be sad and a time to be glad; a time to receive and a time to give; a time to talk and a time to listen. These stances may seem opposite to each other. To me, they are complementary, like back and front, day and night, yes and no, right and wrong. They are not absolute. Either/or dichotomous way of thinking and way of living and relating is not my cup of tea. I like the "and" between two apparently opposites; to be able to see them as different. A lot of unnecessary and harmful pain and suffering has been caused by the either /or- stance-either you are with me or against me- a way of thinking and living and relating. The differences do not have to cause distances if we keep our mind and heart open, to be empathic to others. So work is worship and play is also worship. It is indeed simple unless we make it complicated and difficult. Simplicity is easy to understand but difficult to practice. Small is beautiful but difficult to implement. We all are familiar with conditioning, hypnotizing and brain washing. Liberating oneself from these powerful external forces is difficult. I always appreciate getting such weekly gifts, reading reflective comments by other friends and remaining connected with them.